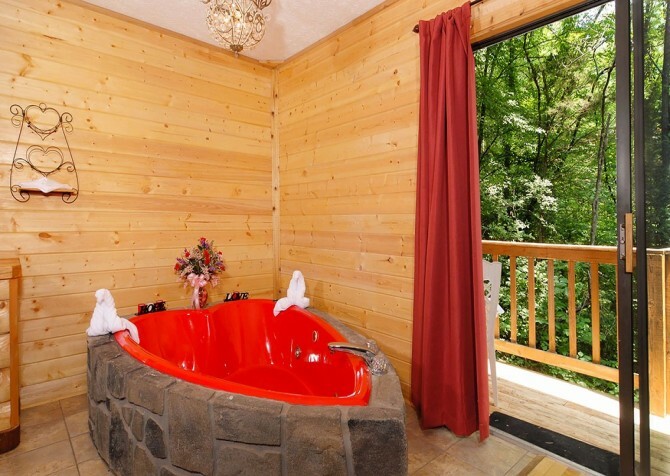 Fall more in love in the heart-shaped jetted tub while relaxing tired muscles, sharing romantic dinners at the picturesque dining table by the window, and sipping wine while lounging in the outdoor hot tub surrounded by mountain forestry. Just a couple miles away, stroll hand-in-hand through the beautiful mountain city of Pigeon Forge to discover quaint shops filled with hand-carved souvenirs, local artistry, and decadent sweets! Looking for the perfect way to celebrate an anniversary or planning a surprise vacation for some much-needed alone time? Romantic Retreat facilitates a dreamy mountain getaway to foster love and reconnection between you and your special someone. 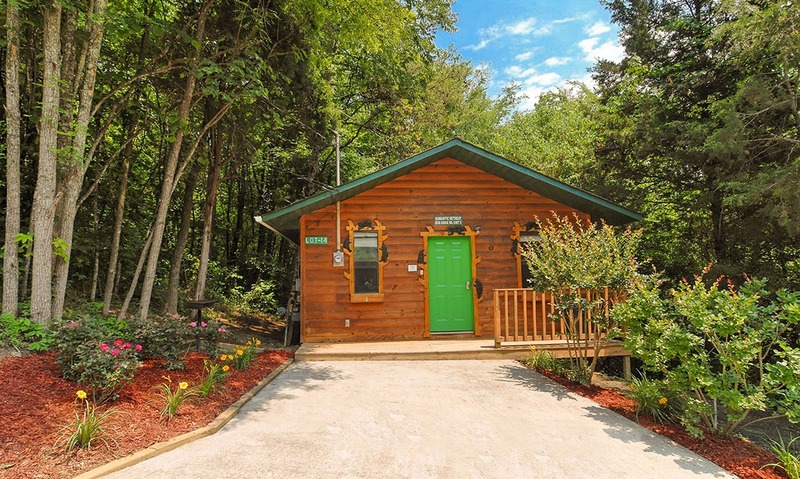 Get all the seclusion of a mountain escape, charming amenities of a quaint 1-bedroom cabin, and therapeutic rejuvenation when relaxing in nature – all while staying only a short 2-mile drive from downtown Pigeon Forge. 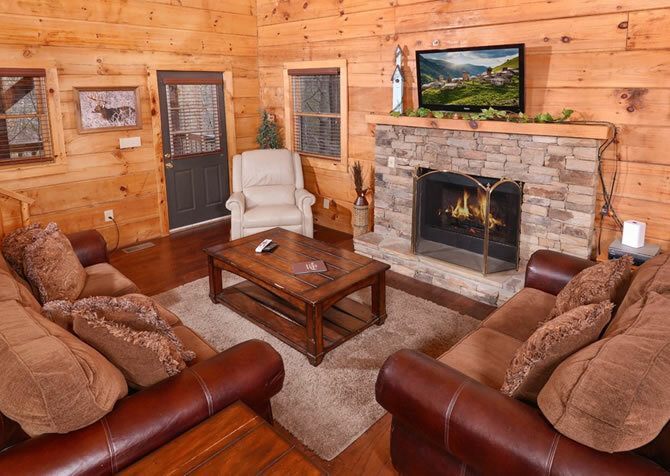 Revisit the youthful sense of adventure you share with your partner and explore all the Smoky Mountains have to offer while creating more cherished memories together. Kayak on the Little Pigeon River, hike to Clingmans Dome for heart-stirring panoramic views, or take on the thrilling zip line courses in Foxfire Mountain. 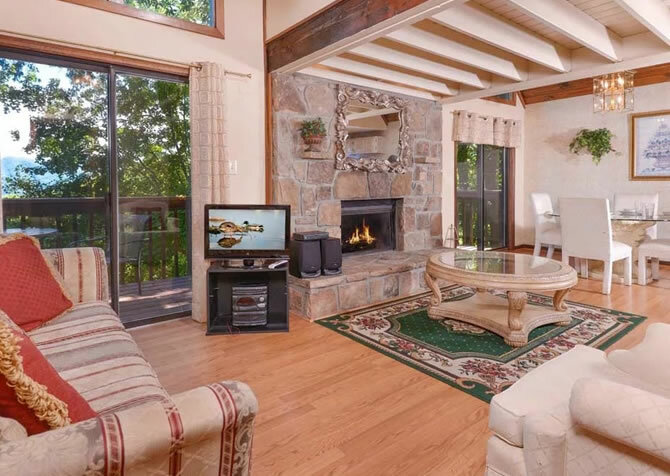 Exploring life together is part of what made you fall in love in the first place, and with such a wide variety of attractions, excursions, and whimsical amenities, Romantic Retreat is a Smoky Mountain fairytale waiting for every couple. After traveling all this way to the Smoky Mountains, step right in to the homey living room space through the front door and take a load off as you ease onto the soft, plump red cushions of the sofa. Rest your head on one of the pillows and worry about unpacking the car later, once you have re-energized from a pleasant afternoon nap in the soft light floating through the window. 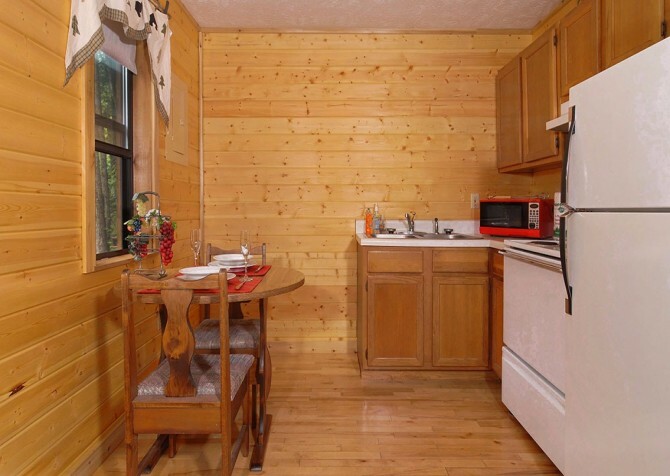 Once you have settled in and explored your lovely cabin abode, pick up a book and read while your partner prepares a romantic dinner in the adjacent kitchen. 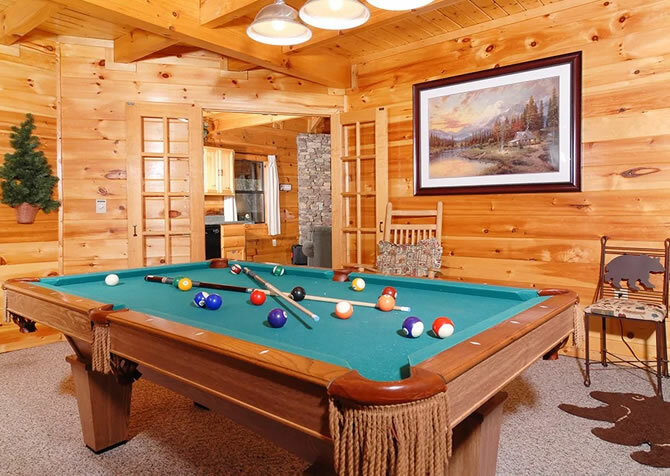 After dinner, play your favorite game of cards, try a new board game on the natural wood of the coffee table, unwind in front of the warm glow of the flames in the stone fireplace, or take a dip in the outdoor hot tub before heading to bed. Impress your partner with a homemade meal right from the cabin kitchen. Open the wooden cabinetry to find pots, pans, dishes, and the tools you’ll need for whipping up a romantic dinner in the cabin. 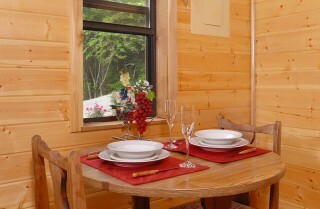 If you’re not up for cooking, order our romantic candlelit dinner (ask when you book) that will have all the ingredients for a delicious steak dinner ready and waiting in your cabin. Or you can pick up dinner downtown and bring it back for a laid-back evening. The sweet wooden dining set is the picturesque setting for dreamy morning meals before exploring downtown and alluring dinners before peaceful nights on the back deck. Open a bottle of local wine, sip some sparkling cider from one of our lovely gift baskets, and break out the card games for a quiet night in. After waking up and spending some time soaking in the hot tub, eat breakfast together in the dreamy glow of the morning sun drifting in from the dining room window. 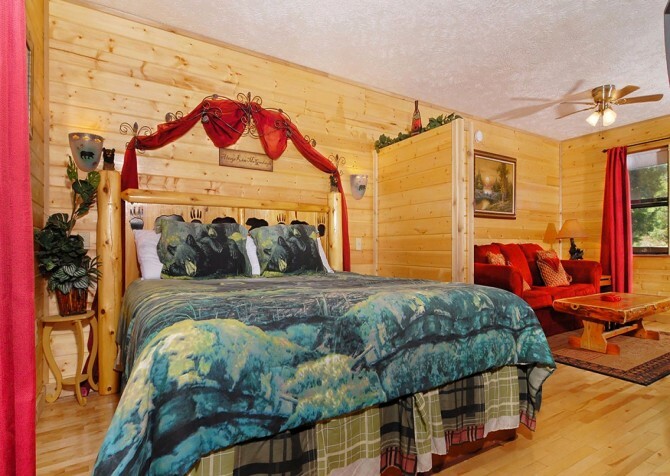 Get plenty of rest and rejuvenation in the spacious king-size bed in Romantic Retreat between days of exploring the Great Smoky Mountains National Park, strolling the cobblestone streets of Gatlinburg, and riding thrilling theme park rides in Dollywood. 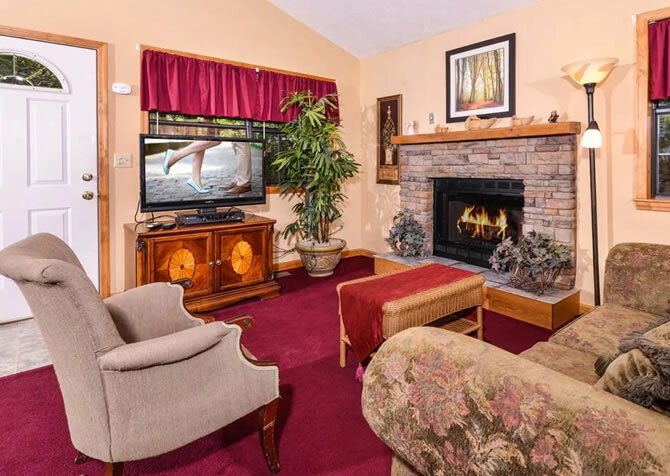 Snuggle under the covers of the quaint mountain-themed quilt while the nearby fire warms the cabin and your favorite movie plays on the mounted flatscreen at the foot of the bed. The next morning, grab your clothes from the wooden dresser drawers for a special day outing to Cades Cove. You can take a whimsical carriage ride before sharing a picnic lunch. After showering off in the bathroom, rest easy in between lunch and evening outings by napping on the bed under the light breeze of the ceiling fan and faint light moving through the trees beyond the sliding glass doors. After a fun-filled evening in Pigeon Forge, take a long, enchanting bath under the chandelier in the heart-shaped jetted tub before turning in for the night. 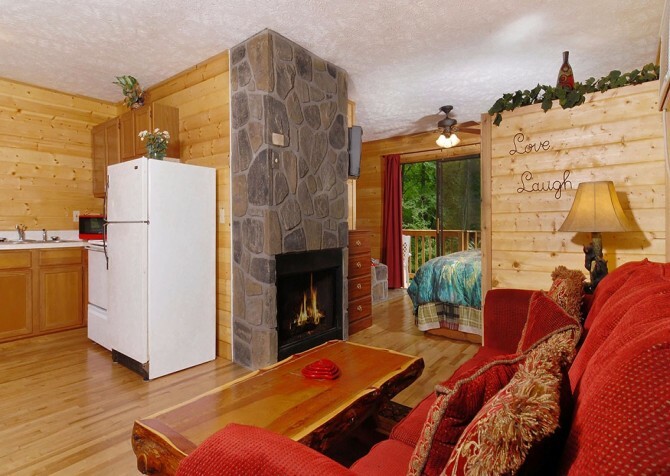 Share intimate conversations and reminisce about your favorite memories made during, what is soon to be, one of your favorite adventures together to the Smoky Mountains. 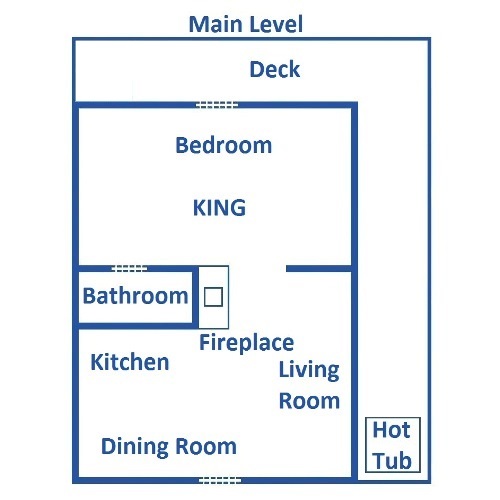 Grab your morning tea from the kitchen before heading to the spacious back deck through the sliding doors of the bedroom. 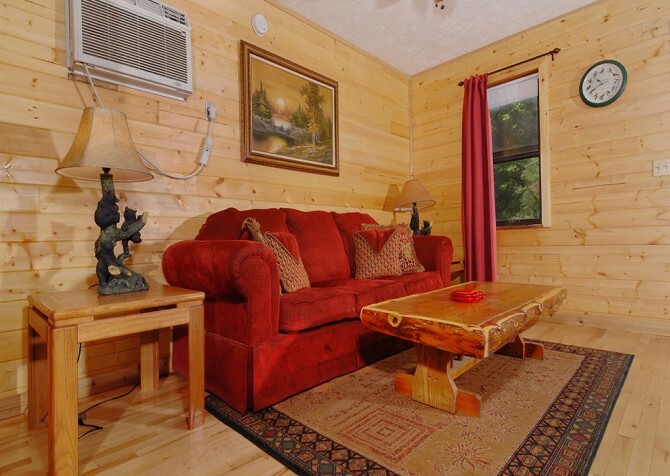 Sip your drink and soak in the beauty of nature as birds chirp, insects hum, and tree leaves rustle in the mountain forests surrounding your cozy cabin. 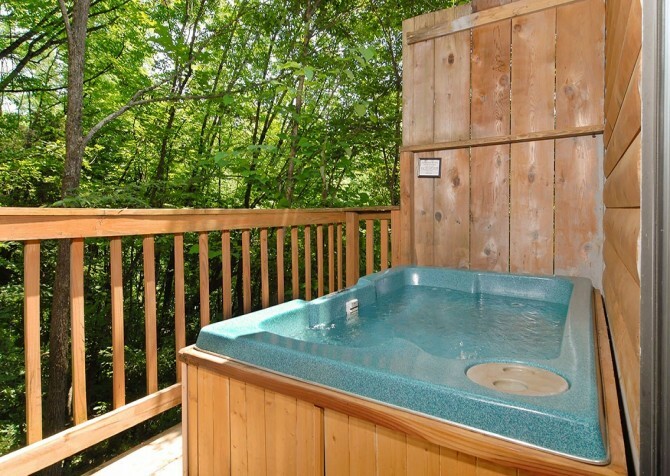 After taking hikes on any one of the Smokies’ numerous trails in the area, soothe your tired muscles in the outdoor hot tub on the deck. Lay your head back and enjoy the fresh air as the steam carries away your stresses. 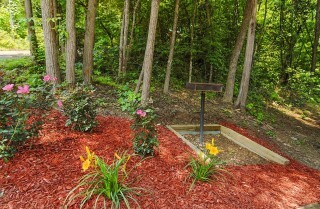 If your shared interest is sports, make a day of the big football game and grill out on the charcoal grill in front of the cabin while enjoying some cold drinks in the cool autumn air. Make an easy meal with foil-cooked veggies and protein over the flames of the grill during a beautiful summer afternoon. Spend a day tasting free wine samples and touring local Smoky Mountain wineries in Gatlinburg and Pigeon Forge! The interactive trail includes 6 award-winning locations, free tastings, free tours, and a “passport” to be stamped at each visit for a special prize! The local wineries offer a variety of Italian, North American, and French-style wines, but the South is well-known for their flavorful Muscadine and Blueberry wines. Have a romantic evening to remember over a delicious steak, rustic mountain cabin atmosphere, and views of the Little Pigeon River from your dining table. The Peddler Steakhouse was built from an original Ogle cabin settled on the river banks with a desire to preserve that Smoky Mountain tradition of welcoming homes, flavorful food, and thin lines between you and nature. The log cabin restaurant has many of its original attributes such as the pecky cypress rustic wood, stone mill fireplace, and the 80-foot Dawn Redwood tree in the front lawn. Reignite the romance with views of the serene waters and mountain forestry just beyond the windows of The Peddler Steakhouse. Explore one of the Smoky Mountain National Park’s most popular areas tucked into the mountains. Cades Cove has an 11-mile one-way paved loop around a scenic mountain valley filled with tons of wildlife, picture perfect views, and historical structures. Take in the sights from the convenience of your car, go biking, or visit the Cades Cove Stables for sightseeing by horseback! 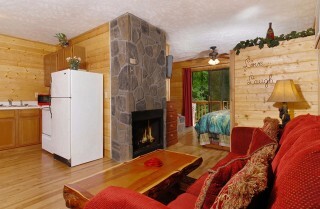 "We spent our 10th wedding anniversary in Romantic Retreat. It was great, and we had a fabulous time this past weekend. 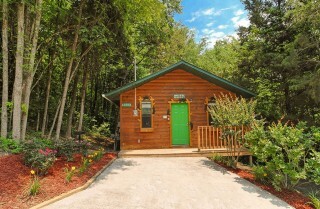 The cabin was beautiful; it looked just like the pictures in the website. Cabins For You certainly knows how to treat their guests. I can guarantee that we will be booking with you within the next few months. I believe we'll be coming back on a yearly basis after what we experienced this past weekend. Words can't describe what a great time we had. Thanks again!"